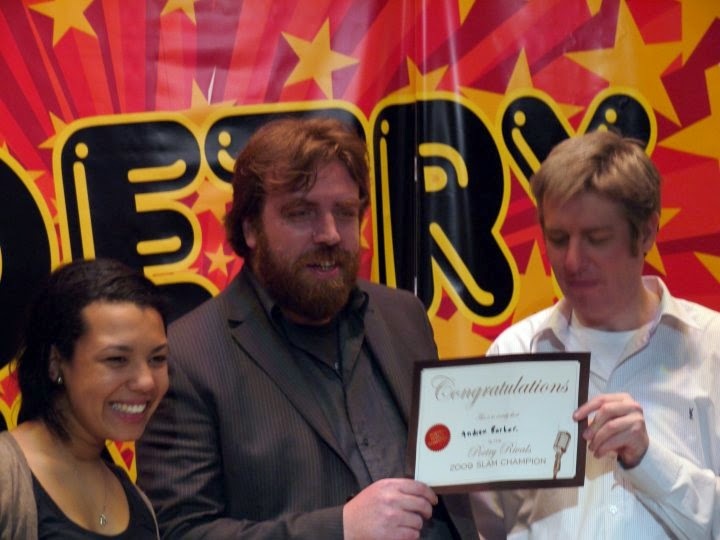 Everything changed when I won the Poetry Rivals competition. I had been writing for about 20 years by that point, but had done nothing with it. On my own, I probably wouldn't have done. My daughter saw the competition online and talked me into entering. I never thought I had a chance. My life at this point was in something of a slump. I'd come to Swindon for a job which no longer existed. I'm bipolar, prone to depression and unemployment was not kind to me. Now I was stuck here and couldn't afford to leave. My marriage was over. I used to work as an IT consultant in places like Hong Kong, Australia and the City of London. Now I watched the same Top Gear on Dave three times a day and only left the house when I had to. I don't drive and I'm not a fan of cars. I think I found the repetition comforting. And then I got invited to the final of the first Poetry Rivals Slam Championship. I was stunned by this. I didn't think I had a chance – I'd stopped thinking of myself as the sort of person who wins things – but I'd give it a go. I managed to talk my Housing Association into paying for the trip all the way to Peterborough. There's a sign right there how far my horizons had shrunk. I was incredibly nervous when I was doing my Money God poem. I'm not normally the nervous type: I did amateur dramatics for a few years as a young man and I'd given any number of corporate presentations, but usually on nice safe unemotional subjects like getting a computer system to recognise changes in tax laws. This was very different. This was me, competing with the top 50 poets from the competition, having to interpret my own words and express them to a panel of judges made up of proper qualified poets. This wasn't like handing a mate a piece of paper and saying 'check this out – I just wrote it'. It wasn't like putting something up on Facebook. I'm not even sure what it was like. I have no frame of reference. It felt so personal. I don't think I'd ever said 'this is me – tell me if I'm any good' before. The compere of the night said that my intensity was such that he feared for me, but it was really just nerves, a newly shy man thrust into a spotlight and putting his own words up for approval. It was probably some kind of public breakdown. I was pretty much terrified. I remember shouting. And now I had a publishing contract. Wow. Never saw that one coming. It wasn't like I had a book or anything. What I had was a 100 page Word document euphemistically called 'Complete Works' that had somehow survived all the challenges of evolving technology. It started off as a word processor document on my old Atari 520 when I was still living with my parents, then laboriously copied word for word to my first PC. It had migrated, constantly growing, as it went from hard drive to floppy disk to USB stick, finally ending up in the email account of my editor, Lynsey Evans. It was when we were putting the book together that I realised how euphemistic my 'complete works' filename actually was. There was stuff everywhere. By the time Lynsey had sent me a formatted draft of what she had, I'd found more. Or written more. Probably about a third of what ended up in the final version of the book was written in the six months between winning the contest and publishing 'Reflections from a Broken Mirror'. I was starting to think of writing as my job. I had a publisher and everything. I got involved with a local poetry group: I was even their treasurer at one point. It didn't last, but that was not for reasons related to poetry. I just got sick of the politics. Twenty years earlier, I'd given up amateur dramatics for the same reason. But I carried on writing. I went through Wikipedia's list of poetic forms and attempted all those that interested me. I wrote a series of articles on poetry for Wise Badger, a now-defunct webzine. In a particularly bleak period, I was even poet-in-residence for Walford Web, an EastEnders fan site (I am no longer a fan). I was involved with a Facebook group that would suggest themes to respond to artistically, and many of the poems for my second collection ('Knitting Orang Utans') were inspired in this way. I stuck with the poetry for about 18 months, I guess. I'm still writing verse and my third collection 'Et Cetera (And Other Similar Things)' is almost ready to publish. But I don't think of my job as 'poet' any more. In November 2011, I tried NaNoWriMo (the National Novel Writing Month - a separate blogpost on my first NaNoWriMo is available here) for the first time, and I was hooked. There's a target of 50,000 words to write for the month, which equates to 1,667 words per day. This is about 3 sides of A4. It's not a big deal. So I tried that, by the end of the month I had 80,000 words, and a few months later, I had my first novel ('The Cybermancer Presents', weighing in at 108,000 words). It wasn't poetry, but I still maintain it was the confidence in my writing that came from winning the competition that let me believe I could do it. It had always been one of those 'wouldn't it be nice if...' things before. To be honest, I didn't really believe I could fill out a story to 50,000 words. I was a poet / songwriter. I wasn't used to writing in bulk. Even the songs that went on for 11 minutes were only a few sides of A4. So I kind of cheated a bit. I came up with the idea of having players trapped in a videogame, fighting from game to game, and each game would be a different genre, so they could go from sci fi to fantasy, etc. Then I'd only have to write a series of vignettes about a consistent cast of characters. Cunning, eh? I'd fill the 50,000 words in no time. What I'd not considered is how long a story takes to tell. By the time I'd done the first level (a fantasy role playing game), I'd written 30,000 words. I looked at the list of the dozens of games I wanted to include and scaled things back a bit. For that novel, at least. I've written three more since in the Cybermancer Chronicles, and there are at least four more to come. To paraphrase a line from The Commitments, I'm happier as an unemployed writer than an unemployed IT consultant. I would define myself as a writer now. It's the job I feel most passion for, the one I spend the most time doing and it neatly encompasses poems, novels and songs, so I don't have to commit myself to anything. I wouldn't say I was a successful writer, because that's usually a function of sales and I'm terrible at marketing, but it's what I do, whether anyone wants me to or not. Scribo ergo sum. I write therefore I am. If winning Poetry Rivals taught me anything, it taught me that. You can find out more about Andrew Barber and his work at his blog.